The Life/form Airway Management Trainers simulate nonanesthetized patients for practicing intubation, ventilation, suction, and CPR techniques. Realistic anatomy and landmarks including teeth, tongue, oral and nasal pharynx, larynx, epiglottis, arytenoids, false cords, true vocal cords, trachea, lungs, esophagus, and stomach. The trainers allow you to practice oral, digital, and nasal intubation, as well as E.T., E.O.A., P.T.L., L.M.A., E.G.T.A., and Combitube insertion. Suction techniques and proper cuff inflation may also be practiced and evaluated. Features durable, rugged, one-piece construction and bifurcated lungs. "Airway Larry" represents an adult with more room to maneuver than the Adult Trainer (LF03603U). With it's slightly anterior position, Airway Larry is a great trainer for introductory as well as advanced students. It is ideal for testing purposes and Combitube practice. Applying pressure to the cricoid cartilage changes the position of the trachea and closes the esophagus, allowing realistic practice of the Sellick maneuver. 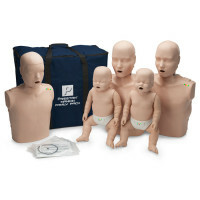 Can also be attached to either NASCO's CPARLENE or any Resusci Anne brand CPR manikin, making it a modular component of the Life/form CRiSis Manikin. Comes with pump spray lubricant. Comes with training stand to mount head, pump spray lubricant, and hand carrying hard case. Three-year warranty. 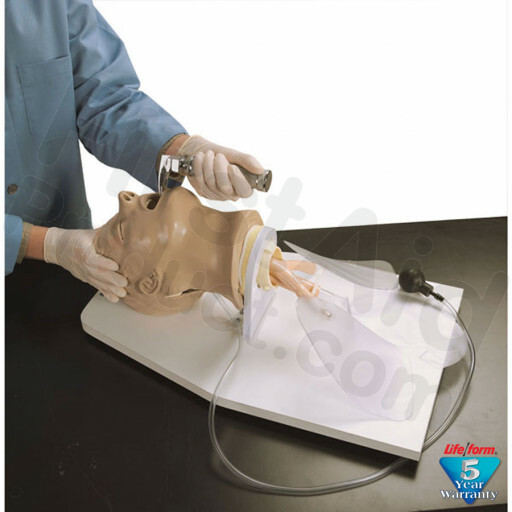 Adult "Airway Larry" Management Trainer w/ Stand.